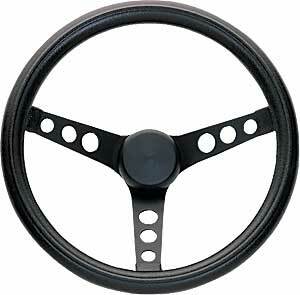 The Grant Classic Series Foam Grip Steering Wheels come in a variety of sizes with extra thick, black foam grip. Two are offered with four chrome spokes (470-434 and 470-857) while most are available with three chrome spokes. Part numbers 470-334 and 470-338 have three black spokes. 334 is rated 5.0 out of 5 by 1. Rated 5 out of 5 by mabel328 from Quick shipping ! I am very happy with the product and how fast it arrived. I was waiting to get it so I could drive my new car and I am tearing up the road now !